STABLING: is $150 for the entire show. A refundable $40 clean stall deposit is required. All stalls must be ordered & paid for by August 21, 2019. No refunds on stalls for any reason. Contact our Show Manager Doug Curry with questions. It is our pleasure to bring you, for the 76th year, the Ludwig’s Corner Horse Show. The Ludwig’s Corner Horse Show Office will be open on the Friday before the show from 1:00pm until 3:30pm. During the show, the Show Office will be open from 7:00am until show closing. The Show Office also accepts credit cards for your entry payment at the window. Please note that Parents MUST sign the Entry Blank for their minor child. This also includes the Entry form for the Open Schooling Afternoon on Friday before the show. Trainers may not sign for junior riders. Scratch/Adds must be done at the Show Office. We do not accept Scratch/Adds at the In-Gate, on Facebook, via Email or over the Phone. The Winner’s Circle is located at the end of the Main Ring, by the Trophy & Awards Tent. All riders may take photos with their horses and ribbons, awards and trophies in this area. Please note that there will be no official show photographer. Exhibitors are free to contract with a professional photographer to shoot their classes. Photographers are welcome to post their contact info on the LCHS Facebook Page or at the Show Office. Photographers are not allowed inside the exhibition rings. Trophy winners at Ludwig’s Corner Horse Show are presented with beautiful trophies which are then engraved with their names next to the past winners. “Keeper” awards are given to each trophy winner to have in its stead. In order to keep the history of the show alive and part of the local community, LCHS engraves & displays the trophies all year in two separate display cases at the crossroads of 401 and 100. Thanks to DNB First and Ludwig’s Grille & Oyster Bar for being a part of one of the longest running horse shows in Chester County and showcasing our trophies inside their businesses. Reserved, shaded tented seating with a table and 6 chairs for use over the entire weekend is available for purchase. These are located above the Main Ring and above Ring 2. This reserved seating is perfect for exhibitor’s families with small children. Book one as a Barn to assemble, socialize and watch the show in comfort. Pets are welcome but must be leashed. The Ludwig’s Corner Horse Show is a member of the Chester County Horse Show Association. Individual members are entitled to CCHSA points only after they have paid their dues and their horses are registered with the association. Ex-Racehorses registered with The Jockey Club are eligible to compete in our TJC Thoroughbred Incentive Program classes for Hunters and Jumpers at the show. You must have your horse registered with tjcTIP and list your horse’s TIP number on your show entry blank when entering. Marshall & Sterling Insurance League points are offered in select classes. Riders must be members of the Marshall & Sterling Insurance League in order for points to count. Only the Rider need join. The all-volunteer horse show committee collaborates with the show manager on planning the annual horse show. These parties determine the class offerings and produce the annual prize list. 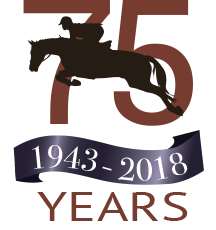 The horse show committee maintains the show trophies; plans the exhibitor awards, prizes & show ribbons, handles the presentations in the rings, and is present and visible at the horse show. Committee members do not make management decisions during the competition. The show manager is responsible for the competition officials & employees, as well as the administration & execution of the competition.